Students, educators, and Black Panther Party members pose with a Black Lives Matter banner in front of North Division High School. WUWM's Teran Powell hears from students and local activists during a Black Lives Matter rally at North Division High School. Schools across the country are participating in the second annual national Black Lives Matter at School Week. It includes events and lesson plans centered around affirming the lives of black students. And Milwaukee Public Schools has joined in, with its own Black Lives Matter Week of Action. 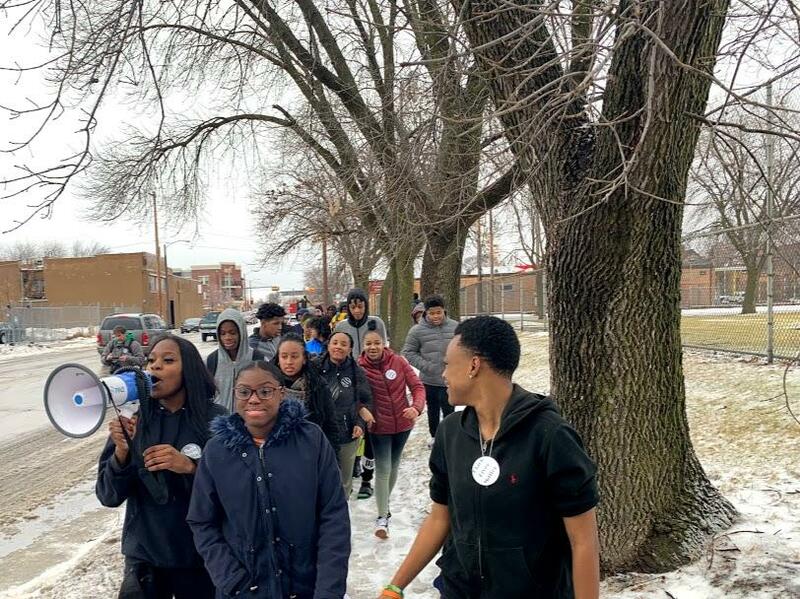 On a chilly Wednesday morning, dozens of students at North Division High School led a Black Lives Matter rally. It was organized by the campus chapter of the group Leaders Igniting Transformation (LIT) — a youth of color led organization. Though some were wearing winter coats and hoodies, students dressed in all black in solidarity with those who have lost their lives to radical, police and gun violence. Students march down Center Street in Milwaukee during a Black Lives Matter Week of Action rally. Passing cars honked in support of the students as they marched through the neighborhood. According to Black Lives Matter at School, the movement started in Seattle, Wash., in 2016 with teachers giving lessons that brought attention to black history and inequalities black people face. Now, school districts across the country are hosting events. The students at North Division chose to focus their rally on police brutality, racism, and violence within the black community. Jashanti Johnson, a sophomore, made that clear in a speech she gave. “The police brutality issue is very disturbing because there are a lot of racist police and they really don’t care too much about black lives. Not all police are the same, but some shouldn’t be in the law industry,” she said. Jashanti Johnson (far left) and Princess Holmes (center) lead the students in the rally. Another point she made, addressing violence within the black community, was that when a black person kills another black person it doesn’t always result in the same level of concern as when an officer kills a black person. That needs to change, she says. “What I’m saying is that we need to come together as a black community and continue to value our lives and demand that others value black lives as well," Johnson said. Another student, Princess Holmes, hopes people pay attention to concerns students are raising during the Black Lives Matter at School week. “We want to make a change basically. We want things to get better instead of how they are now. We don’t want to be treated differently. We feel like we should all be treated the same way because we all pump the same blood,” Holmes said. “I am so proud to see so many students from North Division out here showing some serious community activism. 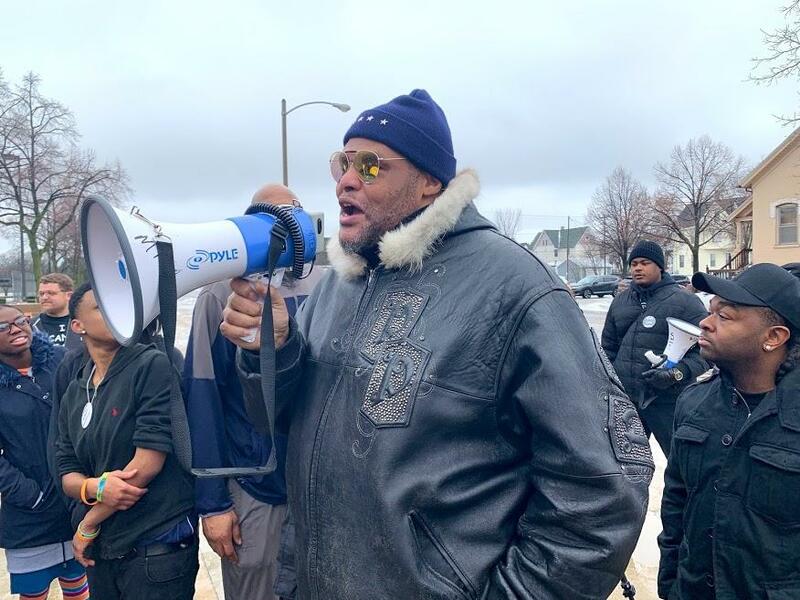 The original Black Panthers of Milwaukee want you to know we got your back,” he said. 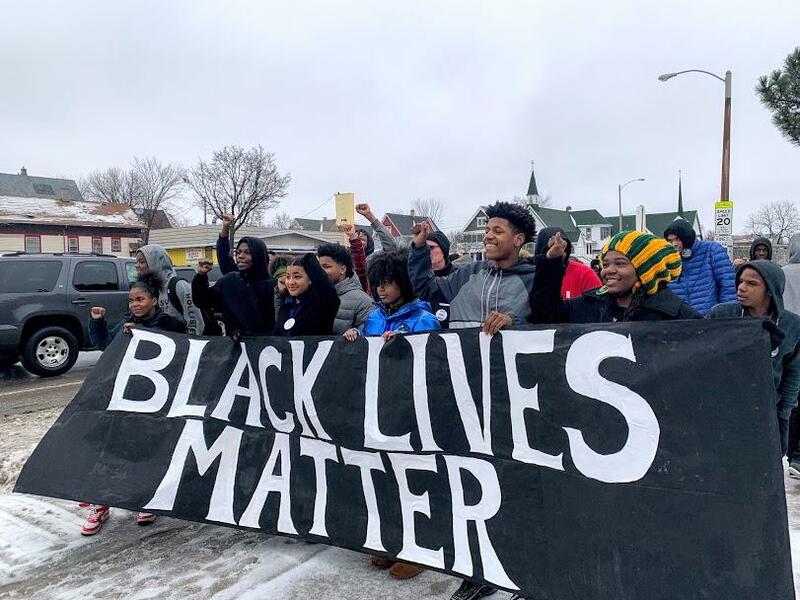 Other Black Lives Matter at School events this week include an MTEA Black Caucus Awards and Soup Dinner Thursday night, and an MTEA Black Caucus Black Lives Matter Social. Support for Race & Ethnicity reporting is provided by the Dohmen Company. Do you have a question about race in Milwaukee that you'd like WUWM's Teran Powell to explore? Submit it below. If you ask a group of people what it means to be an American, you might get a different answer from each person. That’s what Race & Ethnicity reporter Teran Powell is exploring for people from underrepresented groups in our series, I’m An American. This time, she talks to a Hmong woman whose family journey to the United States tells a similar story of many Hmong families who came to this country in search of new opportunities. Milwaukee's 53206 ZIP code incarcerates the highest rate of African-American men in the United States — a statistic that disproportionately affects African-American families that live in those neighborhoods. Those numbers personally affected Beverly and Baron Walker’s family — Baron Walker was incarcerated for more than 20 years. Across the country, Black Panther Parties are once again becoming more active. The organization was founded in the 1960s and was known for its militant self-defense and community-based programs. In Milwaukee, there are currently two active groups. WUWM's LaToya Dennis went out with one, called the Original Black Panthers of Milwaukee, to learn about its mission.